Hopefully everyone has been practicing the VCCV pattern while I have been away. My kids just got out of school so I’ve been busy with end of year madness. 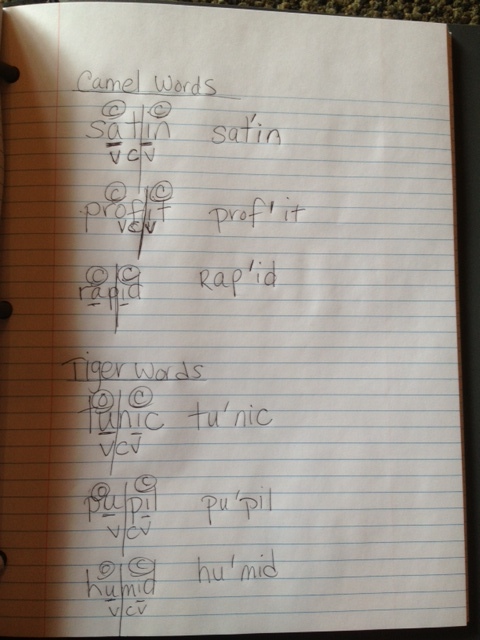 Today we move into VCV – or vowel consonant vowel – patterns. If you have not read the posts on REVLOC or VCCV please do that now and come back. Each of these posts builds on the next. There are not as many pattern types in VCV as there are in VCCV, but breaking the words up into syllables becomes a tad more difficult now, because we have to place an emphasis on accenting of the syllable. That determines where we will break it up (in VCCV we easily break the word between the two consonants, the c’s). For accenting, a helpful rule is that the accent NEVER falls on a schwa, ever. So if there is a schwa in a syllable, don’t accent that syllable. Another accenting trick my OG teacher taught us, (not sure this one is going to transfer in writing, but if you get it then use it, if not, you can move on) if you say a word like you are calling a dog, like you are yelling it, the longer syllable is usually the accented one. For example, if I were calling my dog I might say, caaammm, el – the cam is the accented syllable. If that dog trick doesn’t work for you, then know that 60% of the time, divide after the first vowel to get a long vowel sound. 40% of the time, divide after a consonant to get a short vowel sound, and in special cases, divide to get a schwa vowel in an unaccented first syllable. Japan & Motel — This is a category my OG teacher made up for words that may not fit in Camel or Tiger because they have schwas and you never accent a schwa syllable. You are testing in this one to see if the accent is on the first or second syllable. When there is a schwa, it can push the accent to the second syllable. The ultimate goal of any of this is to pronounce the word correctly. If a student can pronounce the word, there is success. In VCV the reason we are accenting is to know where to divide the word for pronunciation. There is no clear cut rule for division of these types of words, except to test them before dividing. If it is (2), the first syllable would be closed and the word would be rel(short e)ish. Easy enough if you know the word, but pretend you are in kindergarten and you do not know. Now test the word out for which syllable is accented. Relish – underline the vowels. We know there are two syllables because each syllable has to have a vowel. Look for the pattern – Relish eli is VCV. Now if it were VCCV, I would automatically just divide between the two c’s, but it’s not. It is VCV. This means I automatically think about the accenting – that’s where I will divide. I ask myself if there is a schwa, if either syllable has a vowel that has a “u” sound. Nope, not in relish. I call the dog. If I use the short e spelling, the first syllable is the longer sound. I decide that this is where the accent will be. On the first syllable. One really almost has to have heard these types of words before being able to break it up. The goal is to break it and say, oh, I’ve heard rel-ish, but never heard of the word re-lish (which technically speaking would be to lish again because re is a prefix). These types of words are, to me, the hardest to explain in writing and even to comprehend when being taught. If you can get this, you can master syllable division. We like to have rules with everything, but some things just don’t have a clear cut path and VCV pattern is one of them. Below are some words and examples. 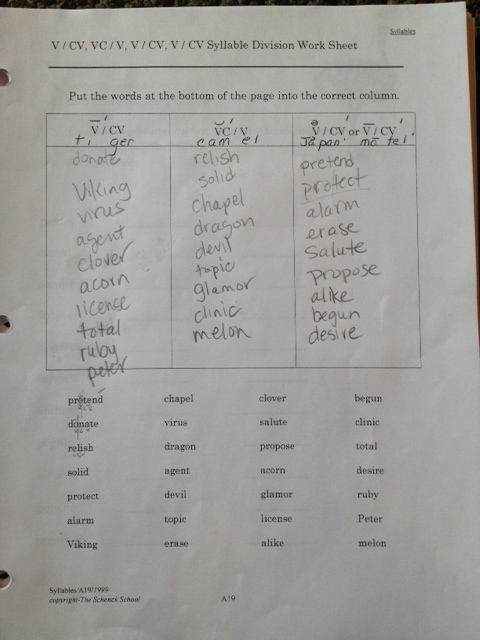 Here is a sample worksheet from my class. 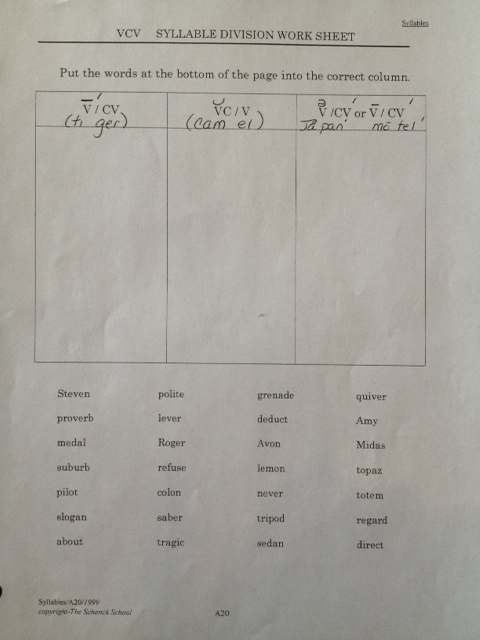 See if you can divide the words and put them in the correct column (answers are below). Absolutely, 100% awesome. Thank you. In the book _Speech to Print_ by Louisa Moats, the figures given are different: 25% of the time for a VC-V word, 75% for a V-CV word. Not sure if that is a difference in how people pronounce the words maybe. Your site is really helpful! Thank you for posting.